Born in 1921, Manuel Llamojha Mitma became one of Peru’s most creative and inspiring indigenous political activists. 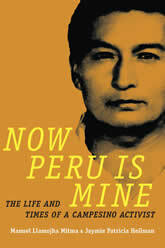 Now Peru Is Mine combines extensive oral history interviews with archival research to chronicle his struggles for indigenous land rights and political inclusion as well as his fight against anti-Indian racism. His compelling story—framed by Jaymie Patricia Heilman’s historical contextualization—covers nearly eight decades, from the poverty of his youth and teaching himself to read, to becoming an internationally known activist. Llamojha also recounts his life’s tragedies, such as being forced to flee his home and the disappearance of his son during the war between the Shining Path and the government. His life gives insight into many key developments in Peru’s tumultuous twentieth-century history, among them urbanization, poverty, racism, agrarian reform, political organizing, the demise of the hacienda system, and the Shining Path. The centrality of his embrace of his campesino identity forces a rethinking of how indigenous identity works inside Peru, while the implications of his activism broaden our understanding of political mobilization in Cold War Latin America.